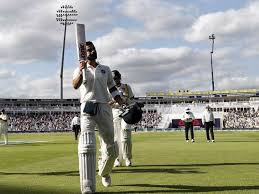 Virat Kohli put on a batting masterclass as he single-handedly led India's fightback on Day 2 of the opening Test against England at Edgbaston on Thursday. The Indian skipper smashed his 22nd Test hundred to rescue India from a precarious 182 for six with his masterful knock helping the visitors in bringing down the first innings deficit to the hosts to just 13 runs. World media, present and past cricketers lauded the Indian run-machine for his gritty knock. Among them was former Pakistan pacer Shoaib Akhtar who was lavish in his praise for Virat Kohli. The fiery pacer praised Virat Kohli for his dedication and determination and said that the Indian skipper was the benchmark for the other batsmen around the world to follow. Virat quality of batting amazes me that he has the ability to score runs with lower order @ the same strike rate with top order which is incredible...I think virat kohli is the benchmark for world batsman’s to follow ..
India had got off to a solid start in the morning as openers Murali Vijay and Shikhar Dhawan chalked up a half-century partnership but the visitors were then rocked by three swift strikes by left-arm swing bowler Sam Curran. Curran, playing in his only second Test, dismissed Vijay, Dhawan and KL Rahul in the space of nine runs. Though India limped to 76 for three at lunch, the post-lunch session bought no respite with all-rounder Ben Stokes picking up two wickets to reduce the visitors to 100-5. However, Kohli refused to give in despite wickets tumbling all around him. Making the most of the two dropped catches by England at 21 and 51, Kohli let out a huge roar in celebration after belting the ball off Stokes for a boundary to bring up his century. He was soon slipping off his wedding ring from around his neck and kissing it in a defiant message to his critics who had blamed for his poor form during the 2014 England series, when he averaged just 13.40, to his now wife Anushka Sharma. India's last two wickets added 92 runs before Kohli was finally last man out after he misjudged leg spinner Adil Rashid's delivery and was caught by Stuart Broad at point.